Earnshaw’s magazine presented the 34th Annual Earnie Awards on Monday, Oct. 3, at ENK Children’s Club in New York City. Industry professionals toasted this year’s Earnie winners in 17 categories ranging from Best Hosiery, Footwear and Accessories to Infants’, Boys’ and Girls’ Collections. Nearly 200 guests filled the festively decorated ENK Café to applaud the chosen companies and watch a fashion show featuring looks from the award winners. 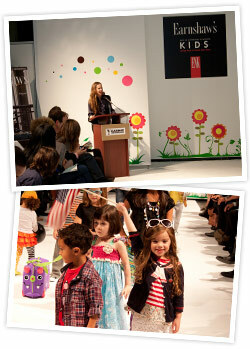 Adorable pint-size models, provided by Funny Face Today Models (FFT Models), delighted the crowd on the catwalk. 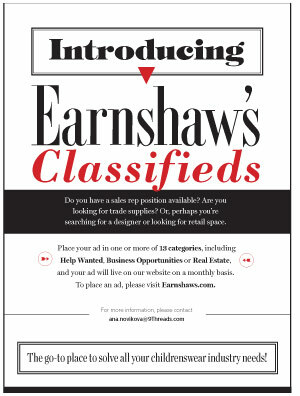 Earnshaw’s also debuted the Hall of Fame awards and inducted four seasoned industry professionals, including Roseann Yarusi, owner of The Rose Garden, Joyce Henry, group vice president and divisional merchandising manager at Macy’s, Ruth Walnick, infant buyer at Macy’s and Janice Weinman, president of Kids in Distressed Situations (K.I.D.S.). Each award was presented by an industry professional touched by the honorees’ contributions to the children’s fashion industry; including Paul Kohne of CachCach (Roseann Yarusi), Jeff Glick of Mamiye Brothers (Joyce Henry, Ruth Walnick) and Gary Simmons of Gerber (Janice Weinman). At the end of the night, Isaac Ash, president and CEO of United Legwear, made a special announcement that the company would donate 100,000 pairs of socks to K.I.D.S. to be distributed over the next 18 months. The evening’s sponsors included K.I.D.S., ENK, FFT Models, WGSN, The Benjamin Hotel and Baked by Melissa Cupcakes. ©2011 9THREADS. ALL RIGHTS RESERVED.